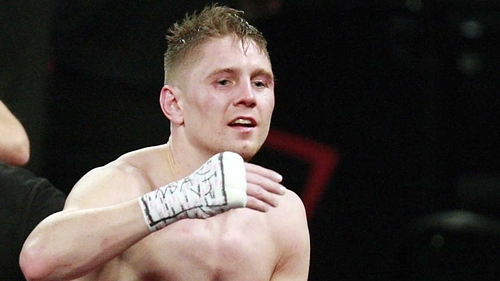 Jason Quigley ended a year of inaction with a stunning sixth round KO of Daniel Rosario. Quigley moved to 14-0 (11 KOs) as a professional after handing Rosario the first stoppage of his career. The ending arrived two minutes and 51 seconds into the sixth round of the fight in Quincy, outside Boston. It was the second time in the stanza that Quigley dropped Rosario. A left hook to the liver sent the Puerto Rican to the canvas and he was fortunate that he made the count. Soon, Rosario was down again and the referee, Mike Ryan, was in to call a halt as Quigley won in his first fight under new trainer Dominic Ingle. In 14 fights, Rosario had never been stopped with the three losses on his card all coming by decisions, in ten rounders to Edgar Ortega in 2014, to Norberto Gonzalez in 2016 and in his only fight of 2017, when he was beaten by John Vera. Quigley was out of action for just over a year due to an injured right hand, but it was the left that did the damage here to give the Ballybofey man his first win under new trainer Dominic Ingle. "I broke him down early on, shook the ring rust off myself and took him out once I had shook the ring rust off," said Quigley afterwards, who admitted to having some early concerns about his right hand. "Lot of doubts in my head letting the right go but I let it go early." The wild-swinging Rosario tacked Quigley a couple of times in the opening round as the Donegal puncher shook off the rust from a year of inaction. Just as the bell for the end of the first came into sound, Quigley appeared to hurt Rosaio, but the teak-tough Puerto Rican shook the head clear. Quigley put Rosario to the canvas in the second round, but the referee ruled that ‘El Duro’ had slipped. It was certainly unfortunate for Quigley that he didn’t get the knockdown. Quigley continued to do his best work to the body of the 30-year-old through the middle rounds and as round six was coming to a close, Quigley shut the lights out. Quigley walked to the ring to a remix of Óró Sé do Bheatha Bhaile. Quigley was between the ropes for the first time in 53 weeks, the time off owing to a hand injury sustained last March as he defeated Glen Tapia to win the NABF middleweight title. It had been a win that ought to have catapulted Quigley right into the limelight of the middleweight division. During his recovery, Quigley made some significant changes to his camp, moving his base from Los Angeles to Sheffield, where he trains under Ingle. Quigley had only gone the distance three times in his first 13 fights in the pro game, including that triumph over Tapia, when he boxed eight rounds without the use of his damaged right paw. And with one lethal swing of the left hand he handed Rosario - who drops to 11-4 - his coat. Quigley’s former Irish amateur team-mate Ray Moylette improved to 9-0 (3 KOs) with a points win over Matt Doherty. In a swing bout that didn’t manage to squeeze into a TVslot, Moylette came good to claim a unanimous decision win over six rounds. Moylette had a busy 2017 with eight wins and an excellent final four rounds gave the Mayo man his latest success. Doherty tacked Moylette a few times during the bout, but in the fifth round Moylette really gained control of the bout. Moylette, a former European champion, landed several telling blows and there was a sense that it wouldn’t reach its conclusion. Doherty did manage to make it to the end, but Moylette, excellent again in the sixth verse, was already comfortably in command.